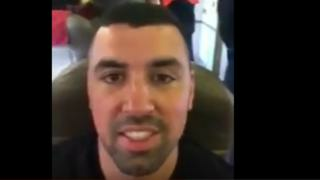 A man who taunted police online after fleeing to Africa has been arrested. Sam Walker published a series of social media posts in June wishing police "luck" catching him after he left the country. Mr Walker was arrested in Merseyside on Sunday, police said. The 35-year-old, of Beetham Plaza, Liverpool, was scheduled to appear at Chester Magistrates' Court on Monday charged with failing to appear at an earlier hearing. Following his posts, Mr Walker told the BBC in June he was in Africa working with people affected by poverty and intended to return to "face the music". Police began investigating his whereabouts after he failed to show up for a hearing in relation to alleged disqualified driving offences on 20 April. Merseyside Police said Mr Walker was wanted by Cheshire Police following an incident in Chester on 4 April. He was arrested at an address on Cronton Lane, Knowsley, at 23:20 BST on Sunday by officers from Merseyside Police's Matrix Disruption unit, which investigates serious and organised crime. Mr Walker told the BBC in June he was in Freetown, the capital of Sierra Leone, saying he first visited the country earlier in 2018 because his grandfather was born there. He claimed to be working with slum residents to improve the supply of drinking water and had paid for a shipping container of food, clothes and toys to be delivered. Mr Walker said he "would have faced up" to his court appearance if it had not coincided with the delivery of the shipment. He added: "As soon as I have completed this project, I'm more than happy to come back."